If Jean Bart were to be added into WoWS, what would you think will make her different from Richielieu? Or rather what would you like to see her have? Wrong ship and class, that is Alsace. If Jean Bart were to be added into WoWS, what would you think will make her different to Richielieu? Jean Bart was still under construction when she fled Toulon to Casablanca to avoid capture by the Germans just before their surrender. She only had 1 operational turret when she engaged the Allied fleet, including USS Massachusetts. Return fire from Massachusetts knocked out her only operational gun turret. 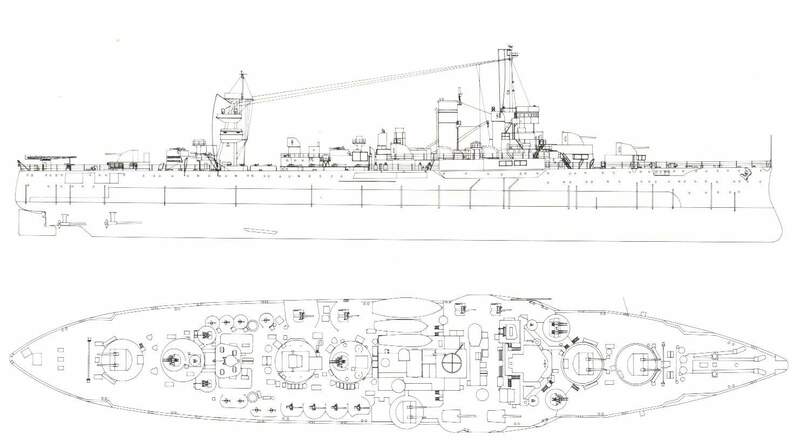 It looks like significant upgrades to her anti-aircraft batteries, fire control, and even radar were installed in later years. Perhaps a air defense BB similar to the IJN Kii? I was just reading that. Basically... Jean Bart will be a Richilieu that has strong AA but with even stronger and a lot more AA. Being able to switch operator firing controls between main guns and secondaries is a feature I often hope for. After all, a Baltimore is just an Atlanta with more armor and 9) 8" guns. If a DD shows up, I'd rather switch main control over to the 5" secondaries and machine gun away until that DD is a little red cloud of pain. Same goes with kiting on the Richelieu and Jean Bart with those nice sets of fast-firing guns. Basically puts an Atlanta inside every T8+ US BB too. If Jean Bart were to appear in-game, she'd likely have to be T9 FXP Premium; with her AA pushing T10/T11 levels while her overall stats aren't much better than Richelieu at T8 (just more HP due to greater displacement and tiering, and greater TDS as a result of the larger bulge she got to maintain a certain draft). Give her Republique's long secondary range, and she'd be perfect. Natural weaknesses being only 8x 15" guns at T9, which is a sizable one due to overmatch immunity breakpoints for many T9 and T10 ships. But it could be made up for with slightly better accuracy than Richelieu too. Lol the second hull on Richelieu already removed the aircraft in exchanged for some nice 40mm quay Bofors emplacements. Perhaps as a premium with her upgrades, or if that makes her too powerful, perhaps ,again, with all her upgrades as a tier 9 Free XP ship, like @YamatoA150 said in the previous post. Honestly? I'd like it if she came out after the whole Ise/Tone problem is sorted so she can be a French battlecarrier. In about the same way that Iowa is an Atlanta with more armor and 9x16" guns. I want this alternate Atlanta hull that gives me Iowa armor and 14 16" inche girls. im thinking maybe more AA then Ricky? How about Torpedoes. All BBs should have some Torpedoes to mess with people. I got your joke and laughed accordingly. I want the alternate Wyoming hull that gives me 10 5"/38 guns in 4 twin and 2 single mounts, with heavy bias toward the starboard side. Tier IV Armored Atlanta, anyone? Radar!?!? Sorry guys Project cancelled for WOWs, lol we already have more than enough Radar in battles.